I didn't say it _is_ the clip indicator. But it remedies clipping and that's what's necessary to program a clip indicator. The macros is only used in the pitch shifter though, so it's actually of no use. Yes, but the v could be volts. actually, clipping removal seems to be done in asm functions and i don't really know asm, so... well... :? the same for me, I had some vsts which do a perfect job there. :gjob: i didn't wanted to pollute more this topic with my opinions, but as i've said, simple free stereo vu-meter plugin with indicator would solve the problem, perhaps more efficiently that any future implemented ompt method, and it will also stay on top, no matter what tab do you open. Plugin support is a huge improvement in ompt lifeline, i advise everyone to use that feature. Well, perhaps what we *really* want, then, is the ability to have GLOBAL plugins, that are applied to EVERY song. We could then remove the EQ and other effects in the system, and always have nice VUs/Spectrum Analysers/EQs to play with. Hidden by default, accessible from the toolbar. That hit the spot, sounds very promising! I could live with something like these. But the reason is very simple. If you add effects support like these as a client-side only feature, people might start adding plugins at the wrong side of their song making it harder to troubleshoot. The same thing, I already see happening with the 5 band EQ that is present already. People actually tweak that for their song and then start complaining that they loose that setting when saving the song as in: its not loaded back when loading a song. For me: the less settings you can tweak on the client-side, the more you are forced to do it for the song, thus the less problem sensitive it becomes. Only thing I would use a better buildin EQ for, is to compensate the bad quality of certain soundcards by boosting the frequencies on my laptop that my high-end pc has so I can match the same sound. Other than that, the less you can tweak client-side, the less your song will be dependend on it. Another example of this is what used to be the pre-amp value. Not only was it yet another volume button, it actually was one on the client-side, which got alot of commotion just because of that. "Warning: this setting is client-side only and it doesn't get saved whitin a song. Therefor, other people won't hear the tweaking you do with this EQ. Its recommended to use a plugin EQ on your song and check the master if you want others to hear the EQ changes when they listen to your song. Ontop of that, this setting is global, meaning that it will be the same for each song. Use this setting only to compensate for missing frequencies by your soundcard. 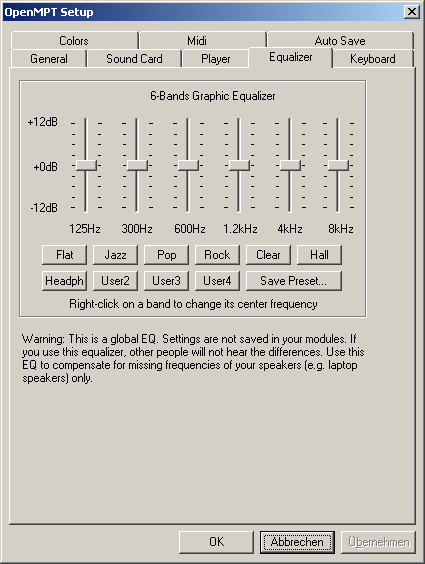 Do you still wish to enable the EQ? [Yes] [No]"
i could add such a messagebox. or rather, add it as a notice below the EQ area. it's enough bands for compensating. I disagree. 3 more would work wonders. 2 on the lowest band and 1 on the end. "Warning: This EQ is applied to any and all of the modules that you load in OpenMPT; its settings are stored globally, rather than in each file. This means that you should avoid using it as part of your production process, and instead only use it to correct deficiencies in your audio hardware." Hmm, that reminds me... I've been meaning to go through everything in OpenMPT and give them a quick dust with my editorial brush.